"You activated my trump card!" 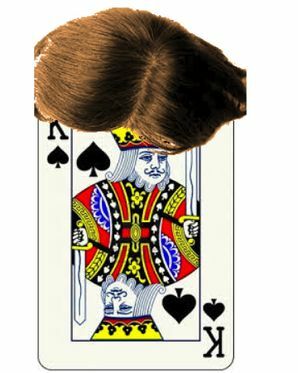 The Trump Card is a rectangular bit of high-quality laminated paper wearing an outrageous toupée. It, of course, is the best card in any deck it finds itself in and is never seen with any one female card for very long. The Trump Card has declared bankruptcy several times despite supposedly having amassed a large amount of wealth on numerous occasions. The Trump Card is considered a knowledgeable mentor which other cards will want to work for. However, it will often fire the other cards if they aren't performing up to its standards. It might be in the possession of the Card-Carrying Villain but will insist that said villain works for him, not the other way around. Hates the game twenty-one card pick-up. Is often marked on the back side in some way to allow the poker-savvy hero to win at least one hand.